I don't know about you, but when it comes to makeup staples, a good pencil liner is rather high up on my list. Today I'm going to be discussing a brand that I feel is well worth a mention if you are also on that hunt for the perfect pencil liner. 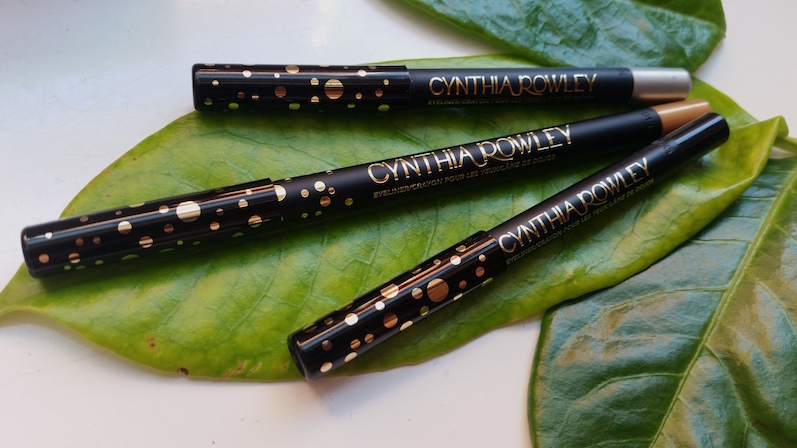 Cynthia Rowley may be better known for her clothing, but her beauty range also contains a collection of both pencil and liquid eyeliners as well as eyeshadows, lip glosses, blushes and bronzers. 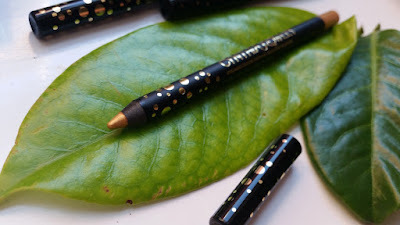 As we're discussing eyeliner pencils, that is what we will be looking at today; the Cynthia Rowley Beauty Eyeliner pencils. I have three shades to show you all: black, gold and silver. Two of them I received in previous Birchboxes (the black and the silver, hence why they are smaller in size) and I purchased the full size gold pencil. They are packaged as sleek, black pencils with gold writing and a plastic cap with gold circles on it. The bottom of the pencil indicates the shade. The pencil then comes packaged in a matte black and shiny gold box. I personally think that it looks great and they feel high quality. The first thing you notice about the Cynthia Rowley Beauty Eyeliner pencils are that they are nice and creamy and glide on really easily. Once you have drawn on your line, you have around 30 seconds to smudge them if you want a smokey eye, but after that they will set and not budge. I've found that the longevity of these pencils is pretty fantastic. You will get hours of wear out of them with no issues. What I love most about them is the opacity. Barely any effort is needed to achieve a bold line, you can do it straight away without the need of going over it, even on the waterline. I find that they have good sticking power on the waterline as well which is fab. If you get watery eyes though for any reason (I do if it's quite windy) then you may get a bit of smudging, but no more than what you can get from some other eyeliners (including waterproof ones). They also sharpen easily which is always a pro (in my last review about the LOC One and Done Shadow Sticks I discussed how they were a little difficult to sharpen, so it can happen). The downside is that removal of these pencils may take a little longer than some others. In particular, the shimmery shades that I have here may leave some shimmer on your eyes after removal, so it will take a bit of extra cleansing to remove it fully (I recommend my favourite tip for removing makeup for a more thorough job). Overall I am enjoying these eyeliners. I love the boldness and therefore the speed in which they can be applied. On those days when I have a little less time (but still enough to throw on some eyeliner) then I tend to reach for one of these, particularly the black. I've been using the black a lot on my waterline as my go to casual look as of late, but the range of colours available allows you to have some fun with your style as well. You can purchase the Cynthia Rowley Beauty Eyeliner pencils from Birchbox (UK) or Birchbox US. 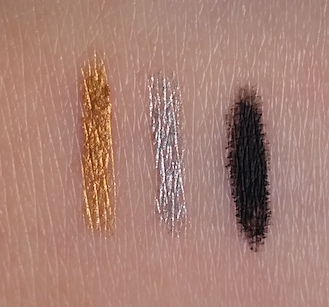 What are your thoughts on the Cynthia Rowley Beauty Eyeliner pencils? What is your favourite eyeliner?